Rock glaciers can be observed in various stages of activity in places such as Rocky Mountain ski resorts and the Andes of South America. 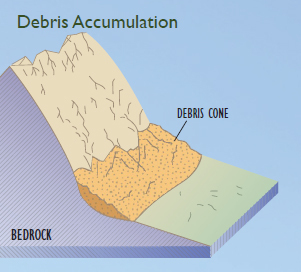 Like landslides moving at a glacial pace, these geomorphological formations consist of jagged rock fragments insulating a core of ice or ice-debris mixture that travels down steep mountains over thousands of years. Dr. Marius Necsoiu, a remote sensing specialist at SwRI, makes GPS-based field measurements with Brigitte Magori, a Romanian student who served on the international project team. Skilled in developing collaborative and interdisciplinary solutions to Earth and planetary sciences problems, Necsoiu has also written or collaborated on more than 70 technical papers and reports. As temperatures rise in the world’s high-elevation regions much faster than elsewhere, scientists are hoping to better understand the effects on rock glacier movement and the potential impacts on everything from the hydrology of alpine lakes to roadway safety near recreation areas. 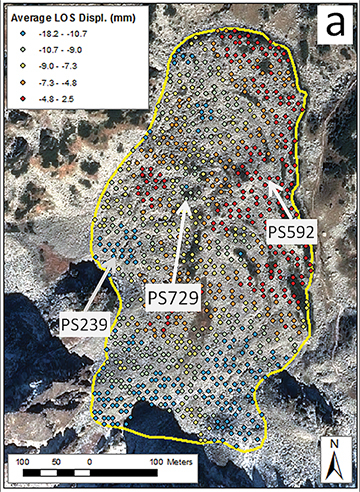 Two studies published in early 2016 highlight how remote sensing methodologies developed by Southwest Research Institute can now measure rock glacier movement down to centimeters and lake surface changes at a detailed scale of analysis. Funded by a National Science Foundation grant, the research combined high-resolution optical and radar satellite imagery with ground observations and historical climate data. The data fusion also helped correlate rock glacier movements with changes in glacial lake levels in Romania’s medium-altitude Carpathian Mountains over a 47-year period. The SwRI team collaborated with geography researchers from Romania’s West University of Timișoara to conduct the investigation and publish the results in papers in Elsevier’s Remote Sensing of Environment and Elsevier’s Quaternary International journals. 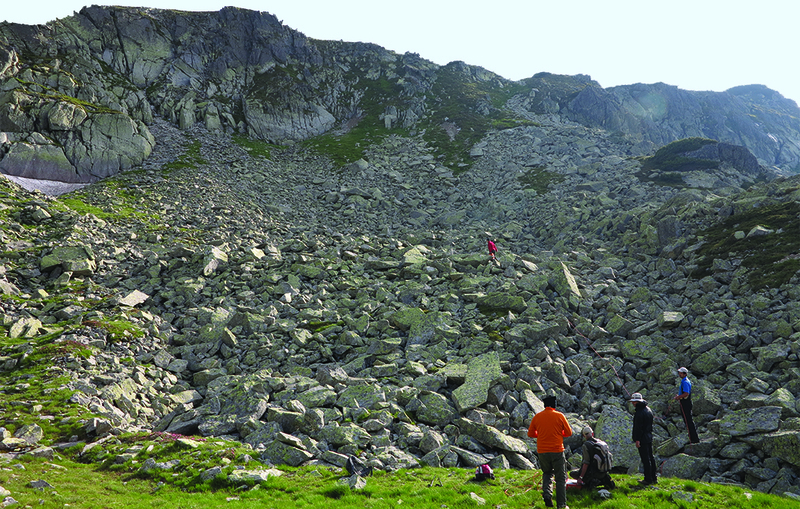 The team used satellite radar imagery and Interferometric Synthetic Aperture Radar (InSAR) techniques to help measure seasonal line-of-sight displacements of rock glaciers in the Carpathian Mountains. 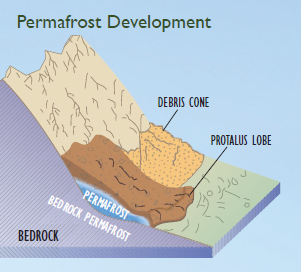 Colors denote rock glacier activity; the blue and light green markers indicate activity, while red and orange areas are inactive. For both the rock glacier and lake studies, the team used complementary sets of optical and radar satellite images. Optical imagery included a stereo panchromatic dataset from a Corona KH-4B satellite reconnaissance mission, a SPOT 5 satellite image, and a set of Pléiades satellite stereo pair images. The dates for the Pléiades dataset coincided with field investigations, allowing scientists to develop a 4-meter-resolution digital terrain model. This model allows orthorectification and co-registration of optical and radar data, to remove image perspective (tilt) and relief distortions. The corrected images have a constant scale, displaying features in their true positions. The InSAR result (a) from one of the studied rock glaciers indicates average line-of-sight displacements at individual point targets. The graph (b) shows displacement trends of three representative InSAR point targets over time. 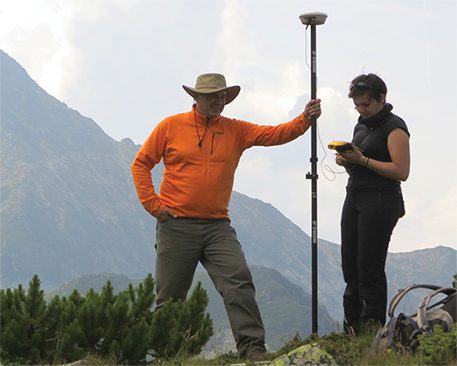 Romanian researchers assisted with both field research and geophysical expertise. They conducted two field surveys in 2014 using global positioning system (GPS) instruments, recording measurements at 15 locations with field accuracies of 20 to 150 centimeters. Post-processing improved the accuracies to between 12 and 65 centimeters, which ultimately helped improve the displacement estimates for both the rock glacier and alpine lake shoreline change analyses. 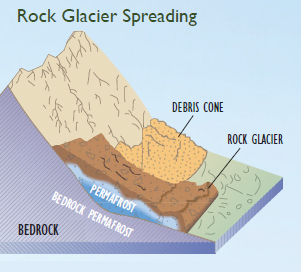 In the rock glacier study, the team used synthetic aperture radar (SAR) satellite and radar interferometry (InSAR) techniques to successfully capture short-term and seasonal rock glacier movements. Developed initially by the U.S. military and NASA’s Jet Propulsion Laboratory in the 1980s, InSAR enables topographic and ground deformation mapping using two or more radar images of the Earth’s surface collected by orbiting satellites or aircraft. 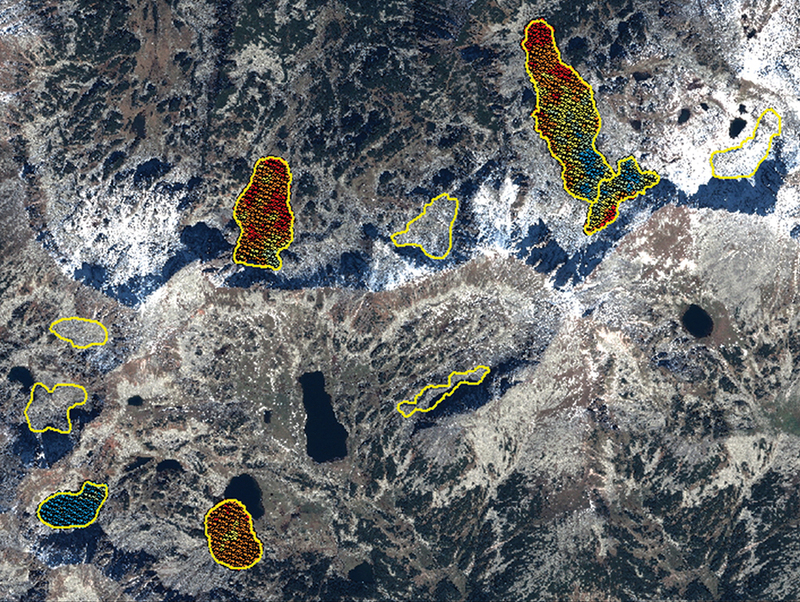 The team employed a variety of InSAR processing techniques to detect, monitor, and evaluate subtle landscape changes. The Japan Aerospace Exploration Agency Earth Observation Research Center provided the Advanced Land Observing Satellite (ALOS) data. Using multi-temporal analyses of high-resolution optical satellite imagery, the study revealed the small-scale dynamic nature and slow geomorphologic evolution of rock glaciers between 1968 and 2014. The study concluded that the Carpathian rock glaciers moved very slowly — only a few centimeters per year — compared to other rock glaciers around the world. The slow movement is likely due to a thin permafrost layer beneath their surface. However, these movements have slightly accelerated during warmer periods since 2007. Graduate students from Romania’s West University of Timisoara assist SwRI scientists in gathering field data on rock glaciers with geophysics instruments. The second study, published in Quaternary International, examined surface area change in lakes near the same rock glaciers in the Retezat Mountains. The study area was selected because the Southern Carpathians host most of the alpine lakes in Romania, including both the widest and deepest glacial lakes. The team analyzed the surface area of 27 lakes in the region and found that their areas fluctuated over the 47-year observation period. While the total surface area increased by only 1 percent between 1968 and 2014, over half of that growth occurred during the last seven years of the study period. The growth was 1.4 times larger from 2007 to 2014 than from 1968 to 2007, changing 7.9 times faster during the last seven years of the study period. This study shows that lake size fluctuated in correlation with several key variables: lake elevation, lake depth, and land cover as well as catchment size and aspect, which are associated with rainfall collecting capacity. A recent climatological analysis in the Carpathian region suggests temperatures are increasing, particularly during the last three decades. Wind speed decreased in every season, while precipitation showed no significant changes. The team posits that the relatively stable behavior of the glacial lakes may be caused by small precipitation variations. That is, seasonal snow-melt and rainfall control the water levels of the alpine lakes more than permafrost thaws. The study also found that the intensity of the geomor-phological processes is mainly controlled by the catchment aspect, which is significantly influenced by rainfall. In the Southern Carpathian Mountains, rock glaciers and alpine lakes are changing slowly. But the SwRI-developed methodology determined that these small, slow changes have been accelerating slightly in the past decade or so as temperatures warm. The slow but accelerating pace of both changes should be substantiated by longer-term studies. This multidisciplinary approach establishes a new methodology that has broad applications around the world. SwRI sees immediate applications in the United States to better understand a range of safety hazards associated with climate change, including rockslides and avalanches occurring in Colorado’s Front Range and Utah’s La Sal Mountains. These techniques can also be used for similar studies in further investigations around the globe. Focusing on areas where temperature changes are relatively large will support making shorter-term predictions of hazards. Questions about this article? Contact Dr. Marius Necsoiu via email or call +1 210 522 5541. Source: Information contained in this story can be found in “Rock Glacier Dynamics in Southern Carpathian Mountains from High-Resolution Optical and Multi-Temporal SAR Satellite Imagery,” Necsoiu M., A. Onaca, S. Wigginton and P. Urdea. DOI: 10.1016/j.rse.2016.02.025, Remote Sensing of Environment. Vol. 177, pp. 21-36. 2016 and “Recent Morphodynamics of Alpine Lakes in Southern Carpathian Mountains using High-Resolution Optical Imagery,” Necsoiu M., M. Mindrescu, A. Onaca, and S. Wigginton. DOI: 10.1016/j.quaint.2015.12.032, Quaternary International. in production. 2016.